Jim Cohen (1928 - 2011) produced Standard gauge stamped steel reproduction equipment of Lionel, American Flyer and Ives classic trains from the pre-World War II era. He also restored classic trains from that era for collectors. Jim had been interested in trains since he was a kid. He rode the trolley lines in and around his home in Bridgeport and New Haven, CT as a young boy. In 1944 he purchased a copy of Model Craftsman that featured an article by Lou Hertz on Ives trains. Louis H. Hertz was a pioneer toy train collector and writer. He was often referred to as the father of toy train collecting. That article was the turning point for Jim and he became an Ives fan for life. It wasn't long after that he bought a copy of Hertz's "Riding the Tinplate Rails". In the book, which was a series of 132 articles originally published in Railroad Model Craftsman starting in 1937, Hertz had written about going through the old Ives factory in Bridgeport, CT and did not find any parts there. Jim took particular note of a small footnote in the book in which Hertz had talked about one particular room in the Ives factory that had been blocked off when he went through it and how there might still be some original parts in that room. Jim wasted no time getting right down to the Ives factory which was then the home of the Bridgeport Fabrics Company. He showed them the footnote from the book and they showed him the very room Hertz had written about. Sure enough a search uncovered several Ives parts still in that room. This brought about a call from Jim to Hertz himself, and it wasn't long before the two of them had uncovered several boxes of original Ives parts hidden away in the third floor of the old factory. However, visitors were not allowed in the building afterward. Jim and Lou Hertz became very good friends. He was best man at Louis Hertz's wedding! Jim's restoration skills were honed as a youngster who scratch built 'O' scale trains. He actually learned to use a spray gun from the late Dr. Ralph Baldwin of Norwalk, CT. Dr. Baldwin was the man behind Baldwin Locomotive Works. Jim Cohen gained lots of experience spray painting the finished Baldwin GG-1 as they came off the line. The first restoration that he actually got paid for was a set of Pocahontas cars for which the owner presented him with a nice Lionel Power House in exchange for his work. That may sound like a pretty good exchange now, but at that time a good power house sold for somewhat less than ten dollars. When another collector saw the Pocahontas restored cars he was so impressed that he immediately sent Jim a black #400E, a gray #392E, an orange #9, and three Girard cars, all to be restored back to their original condition. For the completed job Jim received the huge sum of $80. From that moment on word spread quickly and the Shops of Bridgeport were born. In the early 1960's when Jim was getting started, antique train restorations didn't have the respectiblility they do today. Many collectors believed he was making a terrible mistake. Many collectors actually warned Jim that he would soon develop a reputation and nobody would ever buy any train items from him for fear of originality. Jim did gain a reputation, but it was for being one of the finest restorers of tinplate trains, and his name stamped on the bottom of a restored train actually increased its value and desirability over that of other restorations. 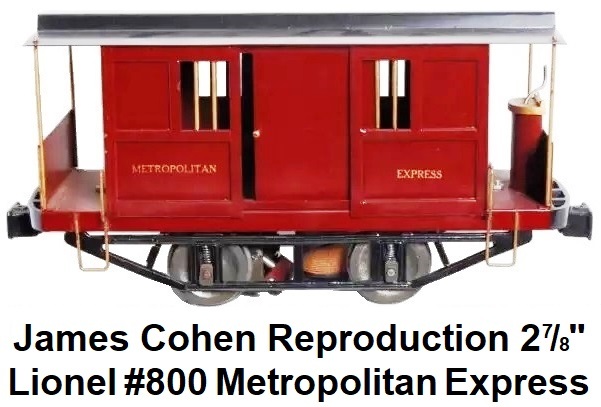 If you were an owner of a rare Standard gauge train from the early 20th Century, and you experienced a problem with breakage, metal work damage or paint needs, Jim Cohen was the person you sought out to make the expert repairs required. It was about 1964 when Jim manufactured his first reproduction of the very rare and beautiful Lionel bodied passenger cars sold by Ives in 1930. Actually they were more of a conversion than a reproduction, but then so were the original Ives cars. Jim followed Ives lead by taking original Lionel #418/#428 bodies and added Ives decals, trucks, couplers and trim. Cars were offered in Pullman, Club, Dining and Observation configurations. These very colorful cars make up the black and red Chief Set, the blue and red National Limited, the orange and black Olympian set, and the latter four car apple green set. Many collectors consider these sets to be some of the most striking ever made by any manufacturer but they are also some of the rarest. Thanks to Jim's years of work, many Lionel #418/#428 sets that would have otherwise been sentenced to the junk box have been transformed into beautiful Ives transition sets to be displayed with pride on some collector's shelf. Modern reproductions have been made of Lionel's #5 locomotive by several manufacuturers. 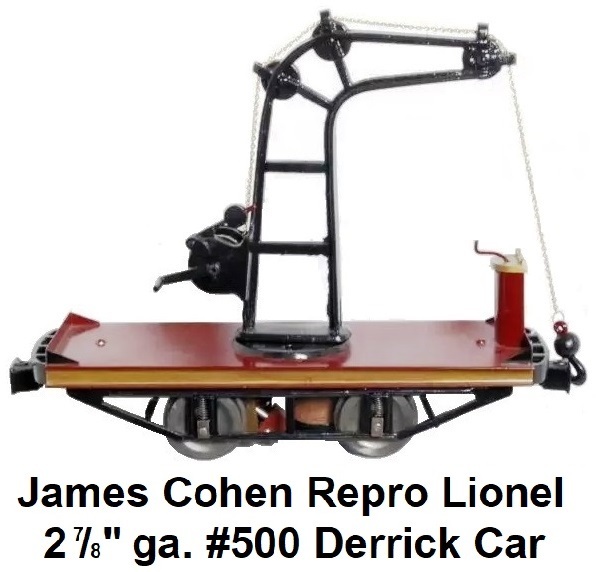 In the 1970's Jim Cohen made reproductions without electric motors or wheels. The idea was that collectors could take their beat up originals and replace the bodies with his replacements. Certainly one of the most striking models ever made by Lionel was the brass and nickel #7 steam engine, and the Cohen version of the #7 is no less a beauty. Jim completed his own thin rim motor to make this loco. All of the brass and nickel beauties he had made up until then used original motors, usually from a beat-up #38 and as such all of these are thick rim engines. With the addition of the new thin rim #7 this completed the fun cycle of variations made by Lionel between 1906 and 1923. 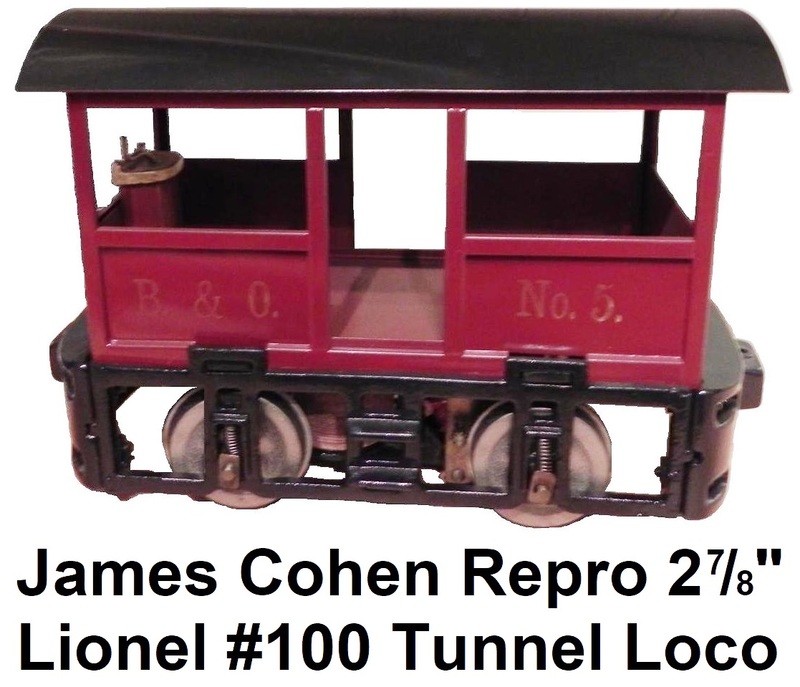 The same is also true of the Cohen #6, which like the Lionel model is the same as the #7 except it is painted steel. 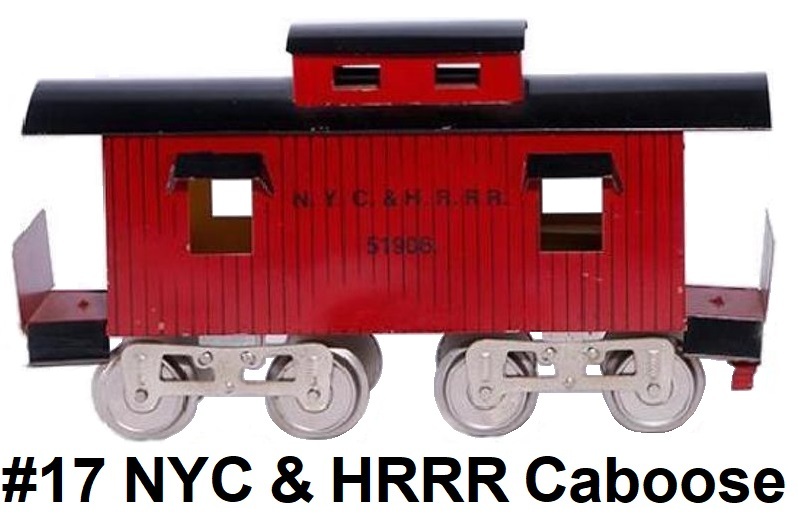 The original Lionel #6's are fairly common with the #7 being a much harder model to find, but the Cohen models are just the opposite with his #6 being the rarer of the two. The #6 was sold only in kit form minus the motor and tender trucks. Jim also made models of the #5 and #51, which like the #6 were initially sold only in kit form but eventually would be made complete RTR with the Cohen motor and thin rim wheels. In 1970 Jim made a decision to go into the train business full time and it wasn't long after that he started tooling up for the #1764 reproduction. The original #1764's were catalogued in the 1932 Ives catalogue, but were actually made by Lionel. The engine was made only one year as 1932 was the last year Lionel produced a separate Ives line. Original versions of this locomotive are quite rare. The #1764 was the only unique locomotive sold by Ives after the move to New Jersey. Reproductions have been made by several manufacturers and there are many more repros out there than originals. Jim made just over 200 of his #1764's. The majority of these were painted the same as the originals but were made of brass plate with nickel plate. 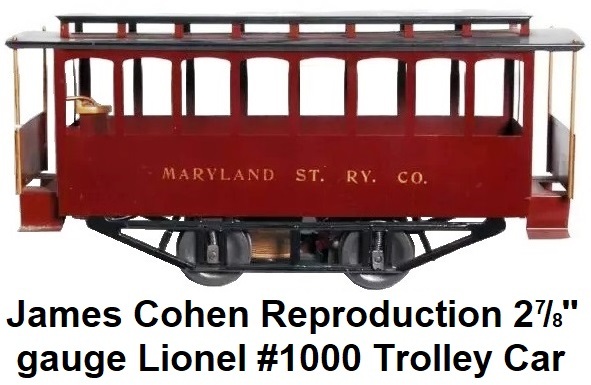 Cohen also produced copies of the Lionel pre-war Standard gauge trolleys. These included Lionel's second largest trolley, the #9, with dual motors, the #200 & #2200 Trolley & Trailer, the #2 open air Summer Trolley, and the #3 Electric Rapid Transit Trolley. Before any Cohen model was finished it had to pass the inspection of a real tough critic. Jim himself. Collectors who knew Jim also knew that he was a fanatic for detail, especially on all the small parts that went into making a Cohen reproduction. 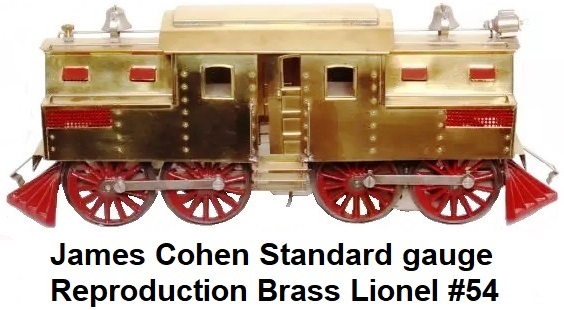 By the 1980's Jim was producing reproductions of Lionel's Standard gauge #1912 Special Brass Electric locomotive. The original was released by Lionel in 1910. The Cohen version was all brass except for the motors that were metal and the wheels and cow catchers which were cast iron. For a time the Shops of Bridgeport concentrated all manufacturing on just these locomotives. It took almost 3 years to bring the #1912 to reality and much of that time went into tooling up for a lot of small parts that were already available from various manufacturers, but since Jim was a perfectionest he would have taken ten years if necessary to get each part just right. 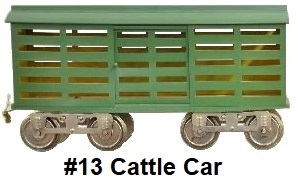 The Cohen #1912 came equipped with a three pole motor and could pull three or four of the early passenger cars, a string of #10 series freight cars or any other load the original could have pulled back in 1910. This giant 15" long locomotive was Lionel's top of the line electric every year it was catalogued. Even though Lionel made this engine for only three years several variations are known to exist, and Jim reproduced each of those variations. In 1910 and 1912 the #1912 Special came with thin rim wheels only, a slide-on headlight, and on the painted originals, script lettering 'New York, New Haven and Hartford'. Original thin rim #1912's were dark olive green, but at least one is known to exist in maroon. In 1911 Lionel sold both thin and thick rim engines. The thin rim engines were probably left over from 1910 production. 1911 was also the year that the pedistal headlight started to replace the slide-on type and the lettering was changed to the blocked 'New York Central'. In 1912 Lionel gave both locomotives a new number. The #1912 became the square cab #42, and the #1912 Special became the square cab #54. Jim was able to produce each of these variations because he built each cab individually, matching each part to the particular engine type. When the cabs were finished he then embossed his name into each of the motor supports, and his own special tag was permanently soldered to the cab. The completed motor and dummy truck were added and the finished engine was given one final test of several trips around the test track to make sure it was operational. Once Jim found a good home for all his #1912's, the Shops of Bridgeport moved backwards in time to the years 1903-04 and began production on the Lionel 2⅞" gauge line that were the first electric trains Lionel ever sold. 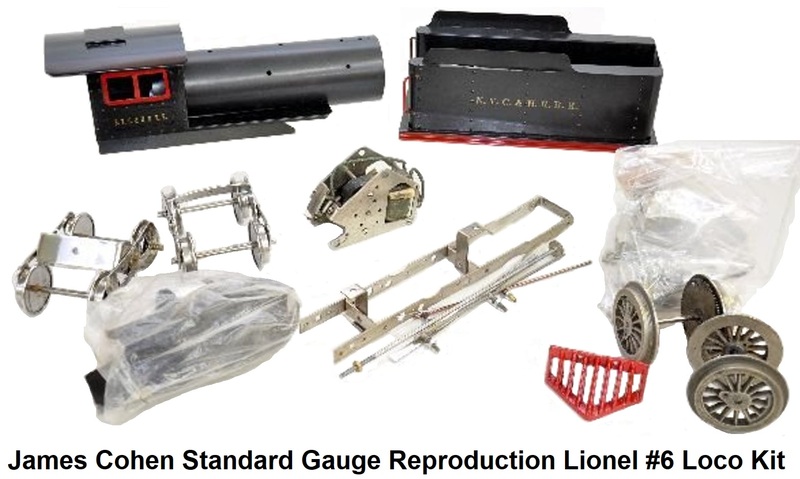 2⅞" gauge trains are so rare that most collectors would not attempt to try and collect them. These somewhat crude models include the B&O #100 Tunnel locomotive, the #200 gondola, the #500 derick car, the #800 Metropolitan Express or rail car, and the #1000 Trolley. All of these powered units came with matching nonpowered trail cars except for the B&O #100. 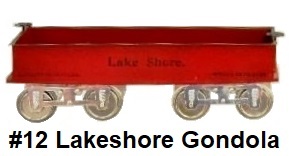 The only 2⅞" gauge models that Lionel made that Jim did not make was the Converse Trolley and the early wooden gondola. The tooling for these reproductions was obtained from McCoy in the 1960's. McCoy had only made and sold non-powered units, but Jim wanted to produce these with motors. He started out making just the non-powered trailer units. He had to build his own motor from scratch. The original motor design had a solid cast iron field core. When these trains were first manufactured by Lionel in the early 1900's, the predominate power source was DC (direct current), as furnished by Edison generating plants in lower Manhattan. The way the original motor was designed did not lend itself to have a machine winding the armature so they had to be wound by hand. This was also true for the field. The powered units were initially shelved due to difficulties encountered getting the motor exactly right, but all the bugs were eventually worked out. Each powered unit came with its own circle of track. 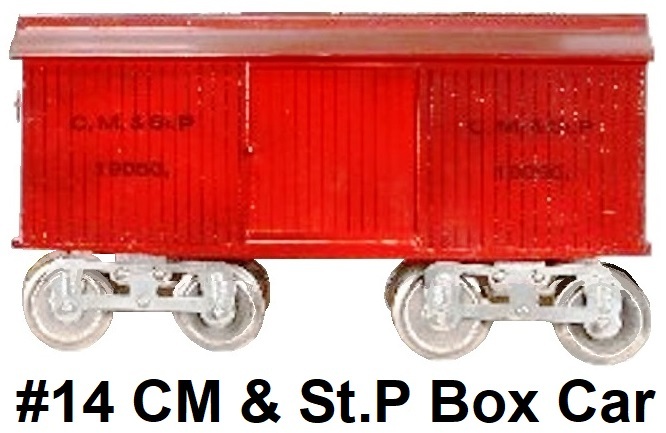 Jim also made reproductions of the original accessories that were issued by Lionel. This included switches, bumpers, 90 degree crossings, and elevated posts to lift a whole track layout. 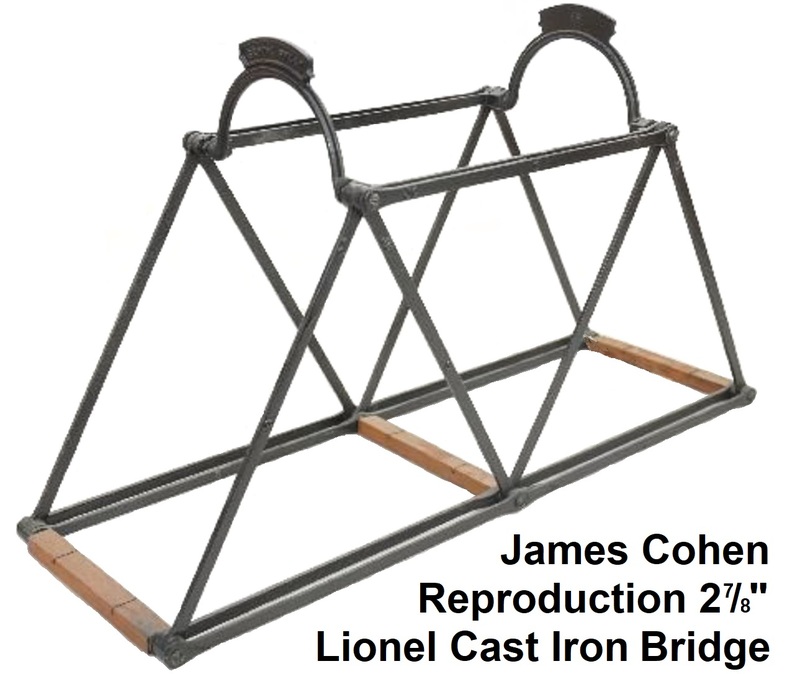 The finishing touch to Jim's 2⅞" gauge collection was a copy of Lionel's cast iron bridge. A full 2 feet long, just like the original it had 22 separate iron castings. 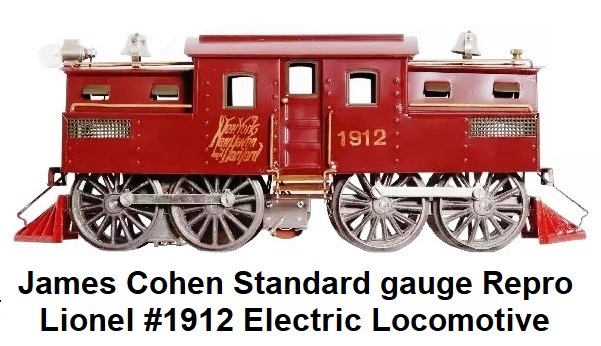 One thing that Cohen did not make was the old battery sets used as a power source for running early trains, but any regular 1 amp DC power source would operate the 2⅞" locos. All the engines reproduced by Jim Cohen were so rare that originals rarely ever come up for sale, and they are virtually impossible to collect. 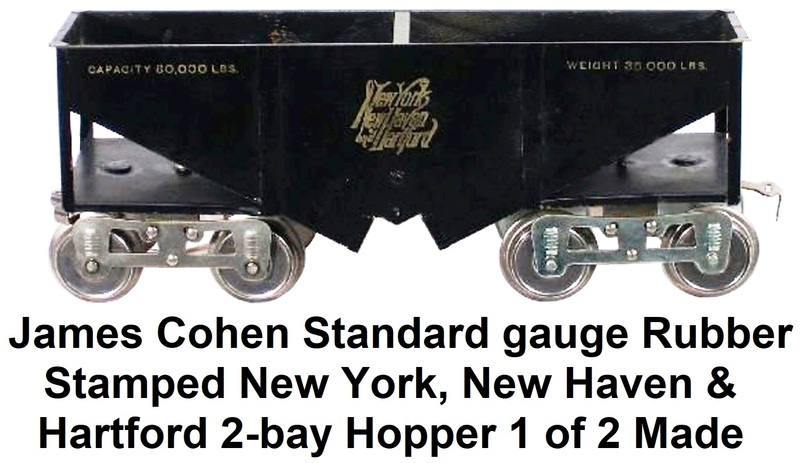 In 1992 Jim Cohen sold the tooling and equipment to reproduce the 2⅞" gauge line to Joseph L. Mania of JLM Trains, LLC. Jim had sold the tooling for the Lionel #5, #6 and #7 Standard gauge locomotives about 10 years prior. However, the purchaser never produced a single locomotive. Five years later the fellow who bought the #5, #6 & #7 tooling contacted Joseph L. Mania and he then acquired that tooling as well. James Cohen passed away at the age of 83 on June 8, 2011. He was born in Bridgeport and resided in Trumball, CT for 40 years. His great passion was his work and he was nationally renowned for his restoration and reproduction of old style tinplate toy trains. He had been a charter Life member in the Train Collectors Association. Per a tribute to Jim Cohen written on the Standard Gauge Blog, "He knew pretty much anyone that was a serious collector or enthusiast in the world of toy trains. And most importantly, he built them with a no compromise attitude. In his prime, he could crank out as many as 30 stellar reproductions of 2⅞" and Standard gauge a month! If he didn't build the trains, there is a good chance he at least refurbished at least one of every item Lionel, Ives and Flyer ever made. He was particularly fond of Brass Pipers. He thought it was one of the best looking models he had ever seen. The guy traded and sold more trains than are in some of the larger collections and his memories of tearing through the Ives Factory in Bridgeport are almost legendary. He was a heck of a story teller and definitely a man that was dedicated to these wonderful toys up until he couldn't handle them anymore."